Start the New Year off right by shopping the selection of New Arrivals! To celebrate, AmericanBridal.com is offering an exclusive coupon for 15% off sitewide! Find tons of great new items like these Vintage Weekender Bags now only $44.95/each. Check out new items from reception decor to bridal party gifts and much more in the sale category. Bonus Steal: Get our top-selling Personalized Napkins at only $18.99! * Coupons valid as noted above; sale prices valid through Sunday January 6th, 2012. Your boss, your spouse, your co-workers...anyone who got you a Christmas gift (or for whom you are thankful this year). In a week, it will be time to thank them for their wonderful (and even not so wonderful) gifts. Stock up and save big with our End of Year Blow Out and Clearance sale event! Find tons of great deals on wedding favors like these Personalized Matchbooks now only $24.95/pack of 100. Enjoy sitewide savings on reception decor and accessories, bridal party gifts, supplies, and much more in the sale category. * Coupons valid as noted above; sale prices valid through Wednesday, December 26th 2012. Should auld acquaintance be forgot...2013 is almost here! Are you having a New Year's party? If so, I have the perfect place to order some amazing invitations, Tiny Prints. Check out the invitation above, one of their more popular ones. These are top-of-the-line invitations, sure to impress. 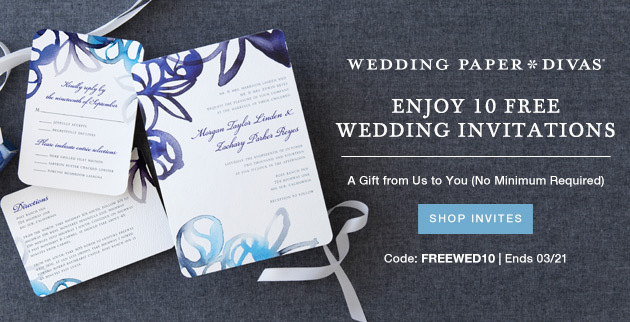 You can completely personalize them, change font sizes, add your own text, and even use their Online RSVP Manager-They'll make you a FREE RSVP website! How cool is that? 1. Visit Tiny Prints and look through their selection of New Year's party invitations.